Hello, How are you ? here we want to announce that we have a new product in themeforest, this product is HTML template which focusing on diving HTML template and sea adventure or travel agency, this template includes the content that often used in diving company, this diving HTML template is also has a lot of features like 55+ pages included, Built with HTML 5, Bootstrap, 5 Home Pages, Retina Icon, Free font used and many more. But although this template is focused in diving and travel agency company this template is also very compatible with multipurpose uses, so don’t afraid if when you want to buy this template but your company is not diving or travel agency, this template is so editable and easy to use so just change some content then , boom! your website is ready. 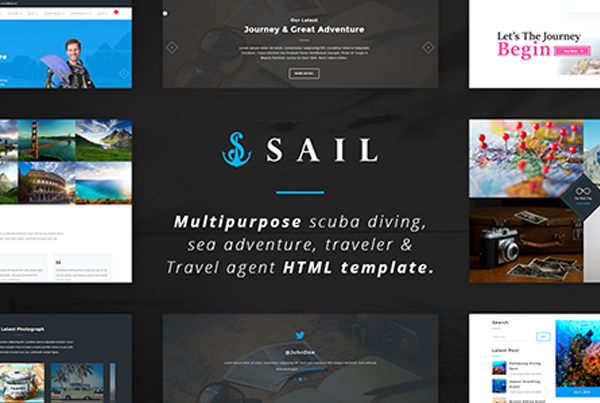 Sail is multipurpose HTML template which focused on sea adventure travel agency like diving snorkeling and also the template for another adventure or travel activity like hiking, surfing and many more. and this template is ready for multipurpose use, just need to edit the content with easy steps. This template is guaranteed and supported so if you want to buy this template and there is some issues with the template you can just contact us for asking and we will reply you on 48 hours maximal (24 hours average).